It’s been one whole month since Yacht Club Games has dropped this impressive DLC/update on us, and it has been a… blast. Plagues of Shadows is the free update for your favourite indie title, Shovel Knight, but this time around we get to play through Plague Knight’s story. Motivated to gather the essences from each of the Knights (they’re not exactly willing to hand over their “essences”, either), our green, bird-faced, friend is on a quest to create the Ultimate Potion! You should all know Shovel Knight by now… and if you don’t, maybe GBD and Captain Indie’s stellar review of the game will help sway you in the right direction (buying the game is the right direction). If you’ve completed the main story, then you’re all set. You boot up a new game, select your “completed” save file to start a new one as Plague Knight. They hang it out there as a reward, but if you’re impatient (or you’ve switched consoles, or tragically lost a save file) the devs are also offering a code that can jump you into the new content right away. If you thought that Shovel Knight was challenging, then Plague of Shadows is a whole different level. The new mechanics are impressively unique, and the old levels are opened up in a completely new light. The whole Alchemy system adds customization and the ability to develop unique approaches to each level. Plague Knight has an arsenal of bombs with various types of explosions. The player is able to alter the fuses (lengths determine how long before exploding, among other types, such as a “sentry fuse” that homes in on nearby targets), casing (determining trajectory, such as bouncing, floating, arcing), and of course powder (explosion types, which can become quite creative. My personal favourite is the component powder that creates larger explosions the more bombs you throw into the same location). Other customizable options include the Burst, which is an explosion that occurs at Plague Knight after holding the action button. These can be set up to cause you to fire a blast, float, or jump even higher. Shovel Knight was very physical, with close combat and shovel bouncing, but Plague Knight plays drastically different. Attacks are from afar, and reaching across those some of those deep pits require quick input with double-jumps, bombs, and bursts. Upon first glance, I was a little confused by the levels. I was honestly expecting more tweaking regarding the layouts. Of course, the first level isn’t anything difficult and acts as a textless tutorial, teaching you the mechanics and how to think on your feet with your new character. The real challenge starts when you embark off against the first Knight. Although the levels feel familiar, you have to bring a completely new outlook to them. Aside from just running around stealing the Ultimate Potion ingredients from each of the Knights in the Order of No Quarter, there’s also a new Challenge Mode added to the game. This is a nice addition because it adds a new level of deployability to the game. You can pick between speed runs, or boss battles, along with various sorts of puzzles and unique levels. The most amazing part about all of this new content is that it was released absolutely free. If you’ve got Shovel Knight aready, all you need to do is update the game and away you go. The whole reason I decided to give this patch another review was because it honestly felt like a whole new game. 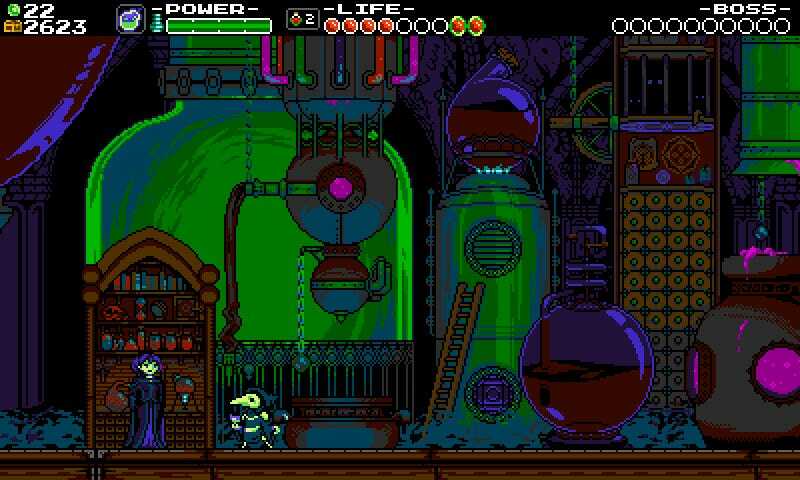 If Yacht Club Games released Plague of Shadows as it’s own standalone game, I would have absolutely given them money for it. They’re just so dang nice! If you don’t already have Shovel Knight, then this should definitely be the deciding factor. Two whole games in one. Amazing art, catchy music, and two unique storylines and game mechanics. Now... go play Plague of Shadows!